The action in West Monroe, Louisiana, continued on Thursday, Feb. 4, with the 5/6-Year-Old Non-Pro finals. Meteles Cat (Metallic Cat x Teles Lies x Lenas Telesis) and Cody Hedlund were victorious over a field of seven horses when they marked an impressive 225 to claim the Championship and $12,245. This was Meteles Cat’s second title at The Ike Derby and Classic. He carried Hedlund’s father, Rock Hedlund, to the 5/6-Year-Old Open Reserve Championship on Saturday, Jan. 30. The 6-year-old stallion is the highest earner by Metallic Cat (High Brow Cat x Chers Shadow x Peptoboonsmal), with an Equi-Stat record of nearly $340,000. 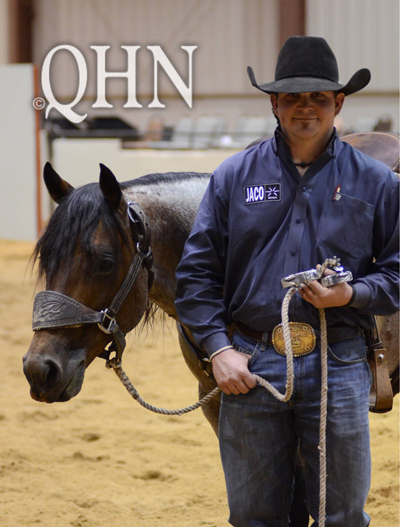 Meteles Cat has been quite successful with Hedlund in the saddle since their first appearance in the show pen at the 2013 National Cutting Horse Association (NCHA) Futurity. The 2015 season was a memorable one, with championships won at the NCHA/Western Bloodstock Showdown In Cowtown and the Breeder’s Invitational in Tulsa, Oklahoma. “Alvin” has proven to be very special to the Hedlunds and they have big expectations for his future in the arena, as well as the breeding shed.